Do you wish to get an indicative valuation of your company? One of the options is to apply sector multiples. However, this might not be as simple as it seems. Valuation based on market comparison is one of the methods that are based on capital market analyses. This method relies on the basic valuation premise which is comparison. The calculation is derived from a comparison of an enterprise with comparable companies that are publicly traded. In this case, the valuer compares the company with similar firms with shares traded on stock exchanges. The selection should include businesses that are comparable based on the following parameters, according to Prof Mařík (2011): yield, risk rate, growth and tradability. However, in practice, such characteristics are difficult to determine. Therefore, the benchmark more often includes companies selected according to alternative criteria, such as the territory of activity, product conformity and position in the value chain. 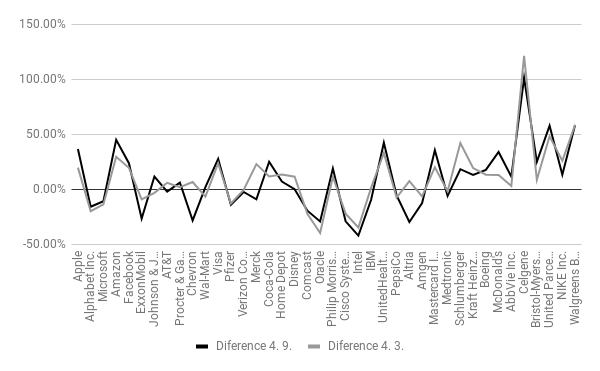 In valuation, methods based on market comparison are common. In our practice, we use data such as those from the Capital IQ database that are further filtered to achieve maximum comparability. However, another approach is to calculate an estimate of business valuation based on average sector multiples. In their expert opinions, even some Czech valuers refer to the database of Aswath Damodaran, a Professor at New York University and one of the best-known experts in business valuations. On his website, Professor Damodaran publishes an extensive database of various parameters employed in the valuation process. And average multiples by sector are one of them. Therefore, we wish to introduce you to this approach to enterprise value estimates and to assess the reporting value of the EV/EBITDA sector multiples published by Prof Damodaran. For this purpose, we have compared the EVs of companies obtained from business valuations using the average sector multiple with the EVs of such companies obtained from stock exchange data. The analysis was conducted on a sample of the largest, publicly traded companies according to market capitalization, quoted on stock exchanges in the USA. Two measurements carried out in 2017 confirmed that a majority (approx. 60%) of the companies under review were undervalued based on the average multiple by sector. However, given that a sample of the largest (according to market capitalization) publicly traded companies were selected, the number of firms overvalued using the average multiplied by sector is unexpectedly low. Considering the great scatter in the values, we have decided to analyse in more detail two selected sector multiples and to test their forecasting ability. For the analysis, we have selected sectors that are beyond the average in terms of the number of traded firms: oil and gas extraction and drugs (biotechnology). Prof Damodaran’s data are updated once a year. Consequently, we tried to reproduce the given multiple with updated data relating to the EBIDTA and EV of companies listed in the Capital IQ database in September 2017, i.e. three quarters of a year after the publication of the relevant multiples for 2017. The results were very surprising. Subject to the same methods of calculation as those originally employed by Prof Damodaran in his calculation, the average multiple by sector was estimated at 13.94. This is a relatively significant difference compared to the multiple known at the beginning of 2017 (17.81). The difference is -22% within less than a year. In the analysis of the biotechnology drugs sector, the reproduced average multiple was estimated at 18.47, while early in 2017, the multiple was 11.62. The difference between the two values is nearly +59%. An analysis of the multiples of two selected industries has shown that average multiples by sector become obsolete relatively very quickly. Further, it should be stated that in a sector with a low number of companies, there is a risk that the average sector multiple is affected primarily by the development of dominant companies. As a result, we can recommend that the valuer (a professional or a non-professional) should at all times use the most up-to-date information in enterprise valuations, and where such information is not available, the application of the average value of the multiple for a longer period of time should be considered. ¹The entire article uses EV for Enterprise Value (EV) and EBITDA for earnings before tax, depreciation and amortization.